The Diocese of Sacramento offers a master’s degree program in pastoral ministry with Santa Clara University. Applicants must have two years’ experience in ministry and have a bachelor’s degree. The degree requirements consist of 15 four-unit classes taken over four years and three summers. The courses are taught through a combination of face-to-face, video conferencing and online experiences. 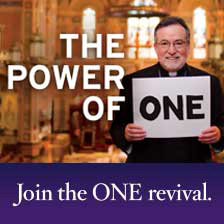 The ONE Campaign Lay Formation Endowment helps to underwrite the cost of this program, funding one third of the tuition cost for all students as well as providing additional partial scholarships for nine students. For more information on this program or to learn about the application process, contact Kevin Staszkow at kstaszkow@scd.org or 916.733.0152. The master’s degree program is part of Bishop Jaime Soto’s strategic plan announced in March 2012, which stressed formation of the laity as one of its seven priorities. The bishop set a goal of certifying an additional 400 lay ministry leaders at the basic level and 100 lay minister leaders at the advanced level in one of several specializations. Special attention is given to recruit lay leaders from the Hispanic, Asian and black communities to these formation opportunities. To learn more about how passing on the faith in a changing church is supported by ONE Campaign funds, click here to view a digital issue of the Catholic Herald Magazine (full story on page 20).